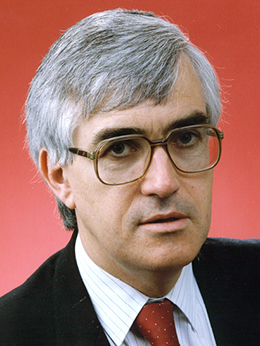 Like a number of Labor members in federal Parliament between 1983 and 1996, Graham Maguire had the good fortune to experience elected politics entirely from the vantage point of government. He entered the Senate well-prepared and throughout his term his steadfast focus on policy issues, especially economic and electoral issues, marked him as a serious thinker who earned the respect of all sides. The double dissolutions of the 1980s required him to fight three elections to earn his tenure of a decade. The circumstances of that period reflected the fortunes of the Labor Party's Centre Left faction to which he belonged. Ultimately, internal rivalries within that faction cost him a winnable position on the Labor Party ticket in the 1993 election. Graham Ross Maguire, born in Adelaide on 21 April 1945, grew up in the working-class locale of Blair Athol, then a notoriously dry and dusty suburb fringing Adelaide's northern approaches. His parents, Norman Ross and Mona Ruby Maguire, née Waye, operated a small business near the inner Adelaide suburb of Norwood. Maguire attended Walkerville and Gepps Cross primary schools and Adelaide Technical High School (1958–62). After more than two years of combining employment in the petroleum industry with part-time study at the University of Adelaide, he won a Commonwealth scholarship that gave him the financial means to study and complete his Bachelor of Economics full-time. Australian involvement in the Vietnam War was a radicalising influence for the young Graham Maguire. In 1967, while at university, he joined the Kilburn sub-branch of the Labor Party. In 1968 he ran for the 'hopeless' state seat of Albert, only getting 23.3 per cent of the two-party preferred vote, and he served as Treasurer of South Australian Young Labor from 1968 to 1970. Maguire followed up his undergraduate degree with a Masters of Economics at the Australian National University which he completed while working as a research assistant to the economic historian Noel Butlin and the historian Keith Hancock. In late 1971 Maguire returned somewhat reluctantly to Adelaide in response to a direct appeal from new South Australian Labor Premier Don Dunstan who asked him to work for the Department of the Premier 'to beef up its economics area'. The position proved to be substantial training for his later senatorial career, as he operated across the face of government and earned standing within the party as an effective negotiator and as an intellectual of conviction—a category more acceptable in Dunstan's world than in most other parts of the Labor Party at that time. His work during this period included co-writing a submission on behalf of the South Australian Government to an Australian Senate committee examining the benefits and costs of foreign investment in Australia. Maguire's movement between policy and politics was rapid. He stood unsuccessfully for the House of Representatives seat of Sturt in the federal elections of 1974 and 1975 and, in 1977, moved to the Premier's private office to take on the role of a research assistant. In July 1977 he married high school teacher Josephine Ruth Martin, with whom he had three children. At this time his prominence within the party rose as he became a member of the ALP State Platform Committee (1977–80) and the ALP National Economics Platform Committee (1978–82), convening a number of party subcommittees concerned with minerals and energy, economics and housing. Maguire continued in the Premier's office after Des Corcoran replaced Dunstan in 1979, and worked for a period under John Bannon as Opposition Leader and Premier. He attempted federal politics again in the campaign for the Senate in 1980, when his third place on the Labor ticket made victory impossible against the Australian Democrats leader Janine Haines who took the fifth and final senatorial position. The double dissolution of 1983 promoted his chances of victory, but the essential element of his success was the reluctant retirement of Geoff McLaren which cleared the way for Maguire to be placed fourth on the Labor ticket and to win the eighth of ten Senate seats on offer. He was sworn in as a senator on 21 April 1983. Maguire was seen by contemporaries throughout his career as a studious and focused individual, well-prepared for discussion and rational in his approach. However, his chances of winning a ministerial post were always limited by his state of origin and factional orientation. Over the course of his career many of Maguire's speeches and questions in the chamber expounded and defended what he saw as the great reforms of the Hawke and Keating era, including the Prices and Incomes Accord in its various manifestations, the creation of the Economic Planning Advisory Council and issues of taxation, especially the taxation of capital gains and fringe benefits—all measures he strongly supported. His capacity for popularising economic issues found expression in a regular newsletter, The Canberra Report, that he produced on a fortnightly basis throughout his period in the Senate. The report was mailed to party members and the media and used by fellow parliamentarians in both Houses as a source of factual information and polemical advice. Not all of the policies that Maguire supported met with success. A notable example was his spirited defence of the Australia Card legislation—the trigger of the 1987 double dissolution of Parliament. Maguire's speeches were carefully prepared, and replete with statistics and contemporary references to media reports. The speeches were generally received in the chamber with a low level of interjection. However, for most of Maguire's tenure his relations with senior Liberal Senator Tony Messner were somewhat tense and combative and this was reflected in the number of interjections and the language that each deployed against the other. Maguire, in a moment of heat, once described Messner as 'a seventeenth century patrician'. Maguire's critical interest in the Queensland economy—against the background of a conservative National Party state government—also provoked some hostility from Opposition senators, especially those from Queensland. In April 1985, an edition of Maguire's The Canberra Report ('Inside the Faltering Queensland Economy') attracted much attention, not least because such aggression came from a South Australia senator. However, as a senator from the governing side, the times suited Maguire's temperament and he was not easily ruffled. Maguire left the Senate aged only forty-eight. His later career drew on his Senate reputation and experience and showed the characteristics that had marked it. He was a member of the board of the Federal Airports Corporation (1993–95) and then a director of Airservices Australia (1995–98), reflecting his concerns for air safety as evidenced by his frequent questions on the topic in the Senate chamber. He was a member of the Foreign Investment Review Board for five years (1993–98)—the first ex-politician to serve on the body, though others followed—and chairman of the Australia-India Council (1994–97), a body formed in 1992 following the recommendations of the FDAT Committee in its 1990 inquiry into Australia-India relations under his chairmanship. Transcript of interview with Graham Maguire by George Lewkowicz, 30 July 2010, Don Dunstan Oral History Project transcripts, Special Collections, Flinders University Library; 'Questionnaire' completed 6 June 1983 for Parliament's Bicentenary Publications Project, NLA MS 8806; 'Profile: Senator Graham Maguire', House Magazine, 6–13 Dec. 1989, p. 3; Herald (Adel. ), March 1980, p. 2. John Summers and Andrew Parkin, 'South Australia: declining fortunes and a new machine' in John Warhurst and Andrew Parkin (eds), The Machine. Labor Confronts the Future, Allen & Unwin, St Leonards, NSW, 2000, pp. 174–81. CPD, 25 May 1983, pp. 818–22. CPD, 22 April 1985, pp. 1297–9, 21 March 1985, pp. 576–7, 7 Dec. 1987, pp. 2597–8, 3 Oct. 1984, pp. 1088–91,16 Sept. 1985, pp. 557–60, 9 Oct. 1985, pp. 918–21, 5 Nov. 1985, pp. 1546–9, 6 Nov. 1985, pp. 1629–34, 29 May 1986, pp. 3007–12, 4 June 1986, pp. 3399–403, 18 March 1987, pp. 855–60; Graham Maguire, The Canberra Report, Norwood, SA, 1983–93; CPD, 12 Oct. 1983, pp. 1483–5, 18 Nov. 1983, pp. 2847–8, 30 Nov. 1983, pp. 2980–4, 6 May 1987, pp. 2377–81, 28 March 1984, pp. 836–8, 27 May 1993, p. 1539. CPD, 9 Dec. 1986, pp. 3633–7, 1 April 1987, pp. 1656–9, 18 Sept. 1987, pp. 339–40, 351–6, 28 April 1988, pp. 2114–15, 3 May 1989, pp. 1709–10, 27 Nov. 1985, pp. 2378–80, 7 Nov. 1985, pp. 1707–11, 13 March 1991, pp. 1846–50. Author interview with Graham Maguire, Syd., June 2014; CPD, 10 May 1985, pp. 1774–5, 27 June 1996, pp. 2479–80, 27 May 1993, p. 1507. CPD, 6 Nov. 1985, p. 1632, 23 Oct. 1986, pp. 1795–6, 20 Aug. 1986, pp. 161–3, 22 April 1985, pp. 1297–9, 24 Sept. 1986, pp. 734–8, 12 Oct. 1983, pp. 1458–60, 28 May 1986, pp. 2915–18, 22 Oct. 1986, pp. 1741–3, 12 May 1987, pp. 2652–4. Lewkowicz interview; Advertiser (Adel. ), 28 Jan. 1992, p. 8; Neal Blewett, A Cabinet Diary, Wakefield Press, Adel., 1999, p. 31. Author interview with Maguire; Senate Standing Committee on Foreign Affairs, Defence and Trade, Australia-India Relations—Defence and Trade, Canberra, 1990, p. xi; CPD, 27 May 1993, pp. 1505–57, 1594–611. This biography was first published in The Biographical Dictionary of the Australian Senate, Vol. 4, 1983-2002, Department of the Senate, Canberra, 2017, pp. 284-288.